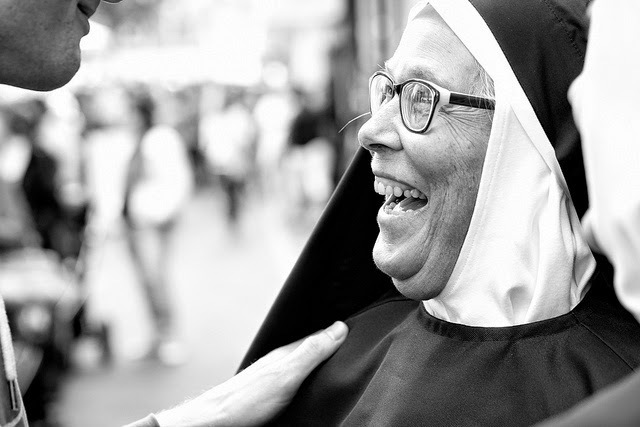 Nuns are so cool. I've found many of them admirable over my lifetime: Mother Antonia (the Prison Angel), Mother Teresa, Sister Madonna Buder (the Iron Nun), and most recently Sister Elizabeth Johnson. And now, Nicholas Kristof sings their praises in an op-ed in the New York Times here. Forgive us for having sinned and thought of nuns as backward, when, in fact, they were among the first feminists. And, in a world of narcissism and cynicism, they constitute an inspiring contingent of moral leaders who actually walk the walk. And then he hits on a communication trend that has been troubling me. My sister mentioned it in her recent post on the Book of Mormon musical. And then interestingly, the influence of his "likes" didn't stop with the author. It affected his friends' feeds as well. The next morning, my friend Helena sent me a message. “My fb feed is literally full of articles you like, it’s kind of funny,” she says. “No friend stuff, just Honan likes.” I replied with a thumbs up. This continued throughout the experiment. When I posted a status update to Facebook just saying “I like you,” I heard from numerous people that my weirdo activity had been overrunning their feeds. “My newsfeed is 70 percent things Mat has liked,” noted my pal Heather. On the flip side, we have a two-week experiment by Elan Morgan: "I Quit Liking Things On Facebook for Two Weeks. Here's How It Changed My View of Humanity." Not surprisingly, she found the exact opposite effect on her newsfeed from what Mat Honan experienced. Now that I am commenting more on Facebook and not clicking Like on anything at all, my feed has relaxed and become more conversational. It’s like all the shouty attention-getters were ushered out of the room as soon as I stopped incidentally asking for those kinds of updates by using the Like function. I had been suffering a sense of disconnection within my online communities prior to swearing off Facebook likes. It seemed that there were fewer conversations, more empty platitudes and praise, and a slew of political and religious pageantry. It was tiring and depressing. After swearing off the Facebook Like, though, all of this changed. I became more present and more engaged, because I had to use my words rather than an unnuanced Like function. I took the time to tell people what I thought and felt, to acknowledge friend’s lives, to share both joys and pains with other human beings. Since I stopped liking altogether...my Facebook stream is more akin to an eclectic dinner party. There is conversation, there is disagreement (mostly) without hostility, and there is connection. It seems as though I am getting more of what I actually want rather than just being served more extreme versions of what I Like. I've never been a big "Like-r" of stuff or companies, but I frequently "Like" friends' statuses. I'm not entirely ready to give up on the "Like" since it can be handy to keep track of organizations or entertainment sources I really do like and want updates from, but I'm going to go do a purge of my "Likes" list and I'm going to consider very carefully what I can add to a conversation with a comment rather than a simple "Like." Everyone who doesn't live under a rock has heard of the ALS ice bucket challenge by now. Yesterday afternoon I was challenged to something slightly different. Tracy Simmons, the Executive Director of SpokaneFAVS, and Skyler Oberst, the Board President of SpokaneFAVS, completed their ice bucket challenge (watch the video here) and then challenged me, along with five others, to a Random Acts of Kindness Challenge. The #FAVSChallenge dares people to partake in at least one random act of kindness within one week from the day they were challenged. The challenge must be on video. Be creative! Those who fail must donate $25 to SpokaneFAVS. We hope this will inspire a wave of goodwill across Spokane, the Inland Northwest and beyond! I'm thrilled and excited to accept! (And I'll even donate in addition to the random act of kindness. No reason for them to be mutually exclusive!) And I invite all of you to do the same, even if you don't happen to get called out by name. Emily thank you for this post. I have read about the like or no like articles and found them really interesting as well. A few days before seeing these two articles show up on my feed I had been thinking that I don't seem to read as many posts from friends but instead so many sharing of videos. U wish I heard more from them as to why they shared something and what us going on during their day. Thanks again for this blog post.